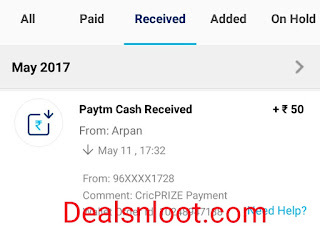 Hello Dealsnloot Readers, Today We are again back with a loot offer to earn unlimited free paytm cash Cricprize Is Newly Launched App Few Days Before. 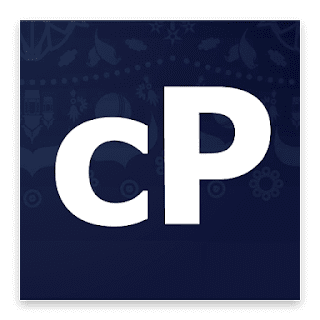 It Provides You Free Points Just For Giving Bid On Live Score Of IPL. 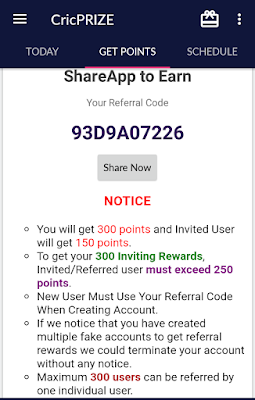 You Can Earn Lot’s Of Prizes Free Of Cost Just By Using This App.As A Promotional Deal App Is Giving Away Refer & Earn , In Which You Can Earn Lot’s Of Paytm Cash Free By Referring Your Friends Currently You Will Get 100 Points As Sign Up Bonus + 250 Point Per Refer.So Hurry !!! 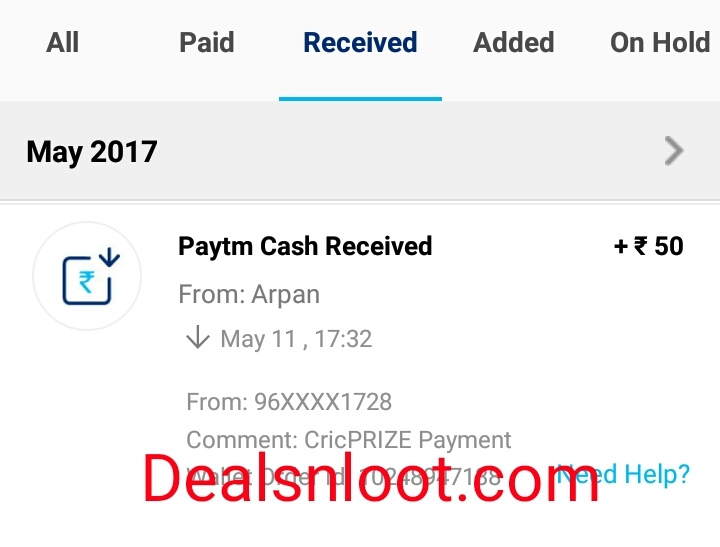 Grab This Loot And Earn Paytm Cash. Update - 1000 Points = ₹10 & As I Say App Is Genuine Proof Added Below & As Per New Update Refer T&C Little Bit Changed Read It Below & App Paying Payout Within 16 Hrs. 1. 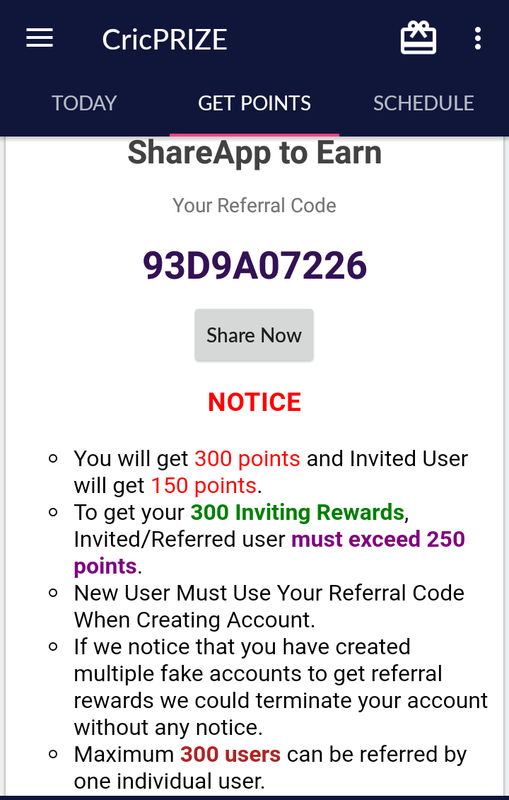 If You Are Using Parallel Space To Make Unlimited Account , You Have To Earn At least 250 Point To Get Refer Amount In Main Account. 2. Simply Start Watching Video’s Each Video Pay You 10 Or 12 Points So In This Way You Can Earn 250 Points (150 As Joining +100 By Watching 10 Ads) Easily From Your Refer Account. 3. Or Click On Take A Break A Ad Will Appear , Just Wait 10 Sec & Close It. 4. In This Way You Can Earn 250 Points Easily To Get Refer Amount. 3. Now Enter Your Number & Verify OTP. 4. Provide Your Name & Password. 5. Now It Will Ask You Refer Code. 7. You Will Get 150 Points As Sign Up Bonus Using Refer Code. Smart Loot - Give Prediction about who will Win Today. Click Let's Guess option on home page and win 10% extra points on your Bids Points. 1. Now Go To “Get Points” Tab & Copy Your Refer Code. 2. For Every Friend Join You Will Get 450 Points Free When He Earn 250 Points. 3. You Can Earn Lot’s Of Points By Referring Friends. 4. Minimum Payout = Rs 50. 1. Click On Wallet Icon On Top. 3. Enter Amount ₹50 & Click Redeem. 4. You Will Get Your Paytm Within 16 Hrs.